The first CD will contain the matinee performance of March 16, 1974 , his first live appearance in Memphis since 1961. The source used was the first generation soundboard tape for optimum sound quality. 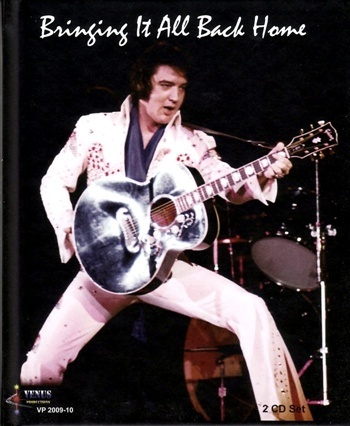 The second CD features the only performance of Elvis at the Mid-South Coliseum in 1975. For the first time EVER this concert will be as complete as possible with the inclusion of An American Trilogy (ending spliced with version from the previous night), and you'll be able to hear this show as recorded that night, without any addition of reverb or any other sound gimmicks. This release as our previous set Black Angels In Vegas will come to you in a beautiful full color book on CD 3 with many pictures and liner notes, spread over 132 pages. Here is your chance to get both shows in the best sound quality ever, in the ultimate package, so ... bring them all back home for good !!! The DVD features 8 mm footage from both concerts 1974 and 1975.